Away from the center of the city, this beautiful temple offers solace to every visitors who comes here in search of peace. For the last 600 years, this temple has become a symbol of faith for the people. Previously, the temple used to be 58 feet long. But due to the earthquake, the dome fell down. However, restoration work has been done and it is back to it is original beauty. The primary attraction of the temple is the 6 feet long deity of Ma Ashapura. This deity is said to be worshipped as ‘Kuldevi’ by the famous ‘Jadeja’ community of Jamnagar. The best part of this temple is the hospitality, served by the pilgrims. Whether you are a god believer or not, still make some time to visit this beautiful temple. 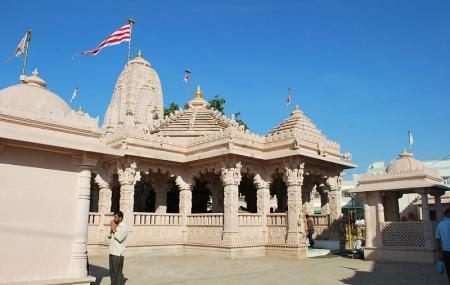 However, the best time to visit this place is during Navratri festival. Follow the Hindu rituals like leaving your shoes outside the temple. Respect the religious rituals and sentiments. Clarify from the temple authorities whether the temple remain closed during afternoon hours . Check the prayer timings from the temple authorities. By hired car or rickshaw. People normally club together Hamirsar Lake and Chattardi while planning their visit to Matanamadh.